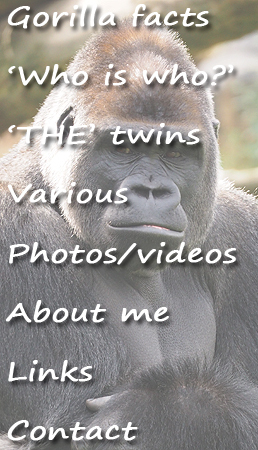 I publish photos and videos on my «Gorillafan Facebook page». This is a public page. I film more often; especially in Burgers' Zoo, where the unique gorilla twin lives. You can watch my videos on «youtube». 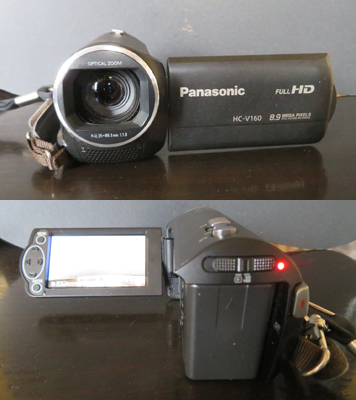 I have a simple digital video camera. I'm not good in filming without a tripod and sometimes even have trouble when moving the camera on my tripod. So my videos are not 100% perfect sometimes, although I do my best ;-) I am and always will be a amateur and not a pro. I can delete the bad parts in Windows Movie Maker. That's the program I use for editing my videos. Check this video, it's with sound! Then you'll understand why there's no sound, don't you? The length of the video is approximately 1 minute. Still curious about my explanation after seeing and -most importantly hearing- that video? Click here.